Yesterday was Friday, but I spent the day cuddling with Miranda and taking naps and trying to get better. As such...I have these two cute headbands I didn't post yet for #FreeArtFriday. Today, though, I'll at least go to the grocery store, and when I do, I'll post one! Now, let's talk about each of these headbands. 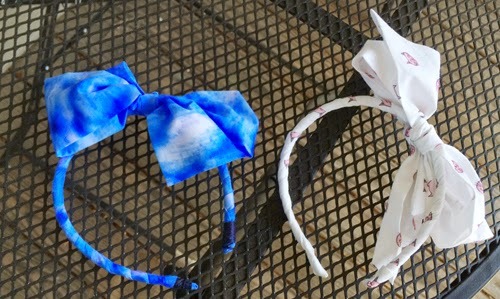 On the left is a headband I made by wrapping the body with Sharpy-and-alcohol decorated fabric. The ends are finished with a little navy embroidery floss because I couldn't make the ends stay. So we'll just call that a little design detail. The second one is a headband made with the cat printed fabric I had made on Zazzle. It's a print of my own hand drawn kitties. This one's got a little bit of a wilder bow because the fabric is different. I Hope that whoever takes these babies home will wear them with pride and cuteness! Check on the ol' Instagram throughout the day for the hashtags #FAFATL and #FreeArtFriday. If you live in the Atlanta area, people are usually posting on Saturday, too.